June 1863. The Gettysburg Campaign is underway. Robert E. Lee’s Army of Northern Virginia is pushing northward through the Shenandoah Valley toward Pennsylvania, and only one significant force stands in its way: Maj. Gen. Robert H. Milroy’s Union division of the Eighth Army Corps, in the vicinity of Winchester and Berryville, Virginia. 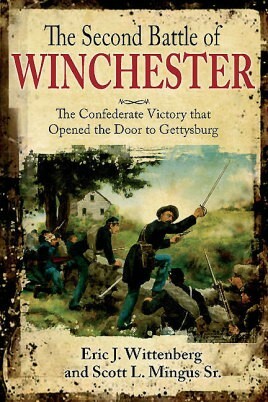 What happened next is the subject of the provocative new book The Second Battle of Winchester: The Confederate Victory That Opened the Door to Gettysburg, June 13-15, 1863. Despite being heavily outnumbered, General Milroy defied repeated instructions to withdraw his command even as the overpowering Second Corps under Lt. Gen. Richard Ewell approached within striking distance. The veteran Indiana politician-turned-soldier was convinced the enemy consisted of nothing more than cavalry or was simply a feint. Milroy’s controversial decision to stand and fight pitted his outnumbered and largely inexperienced men against some of Lee’s finest veterans. The complex and fascinating maneuvering and fighting that followed on June 13-15 cost Milroy hundreds of killed and wounded and some 4,000 captured (about one-half of his command), with the remainder of his command routed from the battlefield. The combat cleared the northern end of the Shenandoah Valley of Federal troops, demonstrated Lee could obtain supplies on the march, justified the elevation of General Ewell to replace the recently deceased Stonewall Jackson—and sent shockwaves through the Northern states. Today, the Second Battle of Winchester is largely forgotten. But in June 1863, the politically charged front-page news caught President Lincoln and the War Department by surprise and forever tarnished Milroy’s career. The beleaguered Federal soldiers who fought there spent a lifetime seeking redemption, arguing their three-day “forlorn hope” delayed the Rebels long enough to allow the Army of the Potomac to arrive and defeat Lee at Gettysburg. For the Confederates, the decisive leadership on display outside Winchester proved an illusion that masked significant command issues buried within the upper echelons of Stonewall Jackson’s former corps that would only make themselves known in the earliest days of July on a different battlefield. Award-winning authors Eric J. Wittenberg and Scott L. Mingus Sr. combined their researching and writing talents to produce the most in-depth and comprehensive study of Second Winchester ever written. Their balanced effort, based upon scores of archival and previously unpublished diaries, newspaper accounts, letter collections, other firsthand sources, and a deep familiarity with the terrain in and around Winchester and the lower Shenandoah Valley, explores the battle from every perspective. The Second Battle of Winchester is comprehensive, highly readable, deeply researched, and immensely interesting. Now, finally, the pivotal battle in the Shenandoah Valley that opened the door to Gettysburg has the book it has long deserved. Scott L. Mingus Sr. is a scientist and executive in the global paper industry. A resident of York, Pennsylvania, he is the author of a dozen Civil War books, including the bestselling Flames Beyond Gettysburg: The Confederate Expedition to the Susquehanna River, June 1863 (Savas Beatie, 2011), and Confederate General William “Extra Billy” Smith: From Virginia’s Statehouse to Gettysburg Scapegoat (Savas Beatie, 2013), which won the Nathan Bedford Forrest Southern History Award and the Dr. James I Robertson, Jr. Literary Prize. Scott has written several articles for Gettysburg Magazine, maintains a blog on the Civil War history of York County (www.yorkblog.com/cannonball), and received the 2013 Heritage Profile Award from the York County Heritage Trust for his contributions to local Civil War history.